What’s a sculptor’s worst nightmare? Her beautifully-sculpted figure drooping under the weight of the clay or even crashing to the floor around her. Whilst I have built-in a decent amount of time to sculpt Sir Nigel, there isn’t the slack to make too many mistakes. Building the armature – or supporting metal structure – for the Gresley statue is definitely out of my comfort zone. I call in friend and sculptor Mark Longworth, who is an expert at building large armatures. While I prepare the heavy trolley, adding two more wheels for strength, Mark gets to work ordering the steel Kee Klamp (like scaffolding) we will need to construct the core of the armature. I pick up Mark from the station and introduce him to my wonderfully Gothic studio. 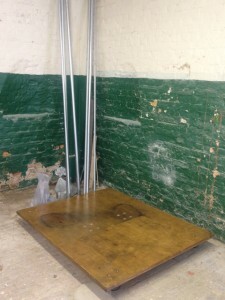 The first day of construction begins. 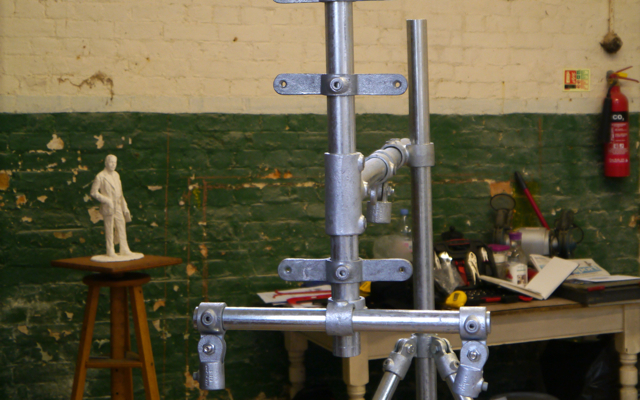 At our side are Mark’s plan for the armature and my scaling-up measurements, along with the maquette of Sir Nigel. The armature needs to support over half a ton of clay so the first step is to provide the back support, which holds the steel pipe that goes into the back of the sculpture and will hold most of the weight of the clay. I’m responsible for the scaling-up and measurements. I am reminded of the adage used in tailoring, “measure twice, cut once”. Not to say I didn’t make a mistake or two! 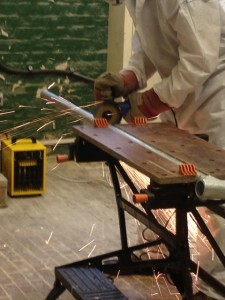 Mark gets out his angle-grinder ready to cut the lengths of steel to size. The sparks begin to fly. Over the next few days it looks just like we are building a 7ft 5in stick man out of scaffolding – spine, shoulders, arms, legs, hips. We have a variety of connectors and joints made from Kee Klamp, which enable us to put a bend in Sir Nigel’s left leg and a bend in his right arm. To save on weight, we add polystyrene to Sir Nigel’s torso. I’m filled with a tremendous sense of relief when we stop and admire the completed main structure of the armature. Thanks Mark, I couldn’t have done it without you. Now I’m on my own, to finish off the more superficial structure of the armature. 2 Responses to "Gresley statue – making the main armature"
Love this, it’s fascinating – I’d love to see a picture of the final armature.